The mysterious world of psychics and clairvoyants have always fascinated me. And, I'll admit it, I have solicited the services of such people, only when I was at my lowest, oddly enough. One turned vicious and told me, after I refused to be sucked into her scam of trying to get more money out of me, that I would get stomach cancer and die. Not something a depressed person looking for some illumination wants to hear. 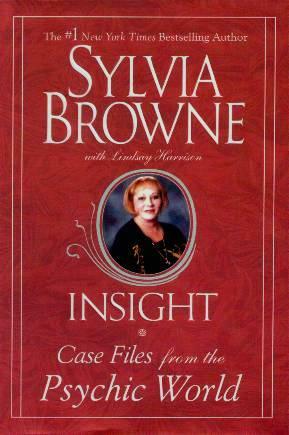 Sylvia Browne intrigues me however. I try to watch her on the Montel Williams show where she delivers uncanny answers to pretty serious questions. People ask the most diverse questions and Ms. Browne unhesitatingly delivers her answers. She never ceases to amaze me with the strength of her convictions, be it a question on someone's career, a missing/murdered person, a ghost they may have in their home, a family member they lost, or whatever. Ms. Browne is forthright if nothing else, and tells it like it is. This book is about the questions and readings Sylvia Browne has given over her fifty years of psychic interaction and offers an incredible introduction to her world. Also discussed are telepathy, ghosts, the Other Side, our charts, and something I found resonated with me, exit points. All this to help us understand more about what we're all about and what we're surrounded by. She insists this is all done in God's name and she's a learned scholar of the religions of the world. There is substance to her words. Ms. Browne has many other extremely interesting books - see my main page for some of her other titles. Visit Sylvia Browne at her website at www.sylvia.org. I have something I'd like to know: Where in this country will I settle for good, where I'll be safe, healthy, happy, and prosperous? Conclusion - A must for those of us interested in this aspect of our lives, and to live vicariously through the readings of others. This book is so hard to put down, you'll want to page-turn till you're through.